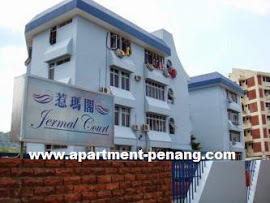 Jermal Court Apartment is located along Jalan Bagan Jermal, Penang. Jermal Court is a low rise and low density apartment comprising a block of 5-storey apartment with a total of 40 units. Each apartment unit has a built-up area of 900 sq.ft. The neighbourhood apartment blocks of Jermal Court are Jermal Jaya Apartment, Taman Kristal Apartment and Wayton Court.